Join this 3.5-hour tour for a leisurely stroll as you eat your way through an iconic Toronto neighborhood that began in the early 19th Century as a home to the Irish immigrants who built this city. Steeped in history, this area was home to the breweries, brickyards, cork stop makers and the largest distillery in the world. As you walk the quaint lane-ways of Corktown, you will see fine examples of British row houses and the cobble stone streets. Along the way, revel in fun facts, history and humorous stories of the city. Tasting highlights include the best Mediterranean food in the city, authentic Mexican cuisine, some global fusion inspired appetizers, a visit to a chocolate shop that has recently been awarded “best dark chocolate in the world”, and a craft beer tasting at a Corktown institution first opened in 1889. You'll be guaranteed a full belly and a newfound knowledge of Toronto after your 7 tasty stops. 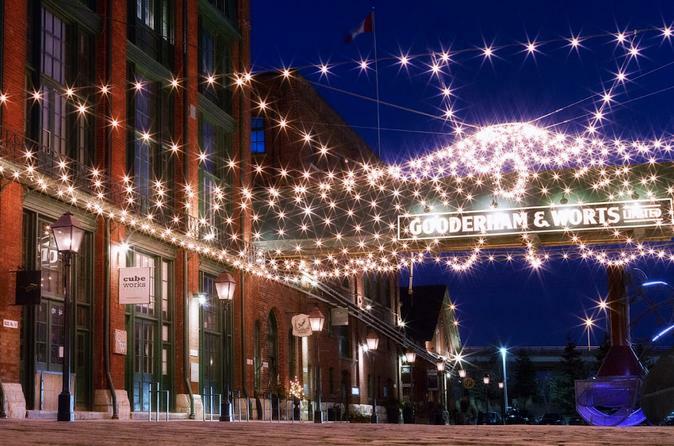 A Toronto Food Tours uniformed guide will be waiting for you when you arrive at the watchman's gates of the distillery district at 55 Mill Street. First up, you'll grab a cup of coffee at one of the the city's best coffee roasters. Then head off to stroll the cobblestone street of what was once the largest distillery in the world and now a national historic site. Your guide will give you the history of the area and a look into the family that helped shape modern day Toronto. You will stop to fill your bellies at a French Bistro and an artisanal chocolate maker who recently had their dark chocolate named "Best in the World". Next, it is off to the Canary district, Toronto's newest neighborhood and previously home to the PAN AM Games Athletes Village. After tasting some of the best Mediterranean food in the city, head out to the final neighborhood: Corktown. Along the way, stop for some delicious Mexican food, a sweet treat and one of Chef Scott's favorite dishes at a local eatery. In all, you will taste 10 dishes at 8 locally owned restaurants and bars. You'll finish your tour with a craft beer tasting at a Toronto institution dating back to 1889. The tour lasts approximately 4 hours.